When will be The Last Leg: Live from Rio next episode air date? Is The Last Leg: Live from Rio renewed or cancelled? Where to countdown The Last Leg: Live from Rio air dates? Is The Last Leg: Live from Rio worth watching? Stephen Mangan runs interference for Adam Hills, Josh Widdicombe and Alex Brooker for an alternative look at the day's events. David 'Weirwolf' Weir gives a very special performance ahead of his 800m heat this evening, and Paralympic sprinter Libby Clegg and guide Chris Clarke drop in. Expect more sketches, clips, and whip-like wit and nothings-off-limits #isitok questions from viewers and athletes alike. Comedian Katherine Ryan joins Adam Hills, Josh Widdicombe and Alex Brooker for more high jinks and alternative review from the Rio Paralympics. The boys are joined in the studio by British medal winners for sketches, clips, and anarchic discussion of the Games via no-holds-barred #isitok questions from viewers and athletes alike. Shooter Matt Skelhon; wheelchair fencers Piers Gilliver and Dimitri Coutya; and Jack Rutter, captain of Men's 7-a-side football team, join in the fun. Adam Hills, Josh Widdicombe and Alex Brooker are live in Rio for the 2016 Paralympic Games. The guys are joined by special guest Katherine Ryan, and medal-winning athletes for the penultimate leg of their comedic take on the Rio Paralympics with sketches, clips, and taboo-busting #isitok questions from viewers and athletes alike. Marathon man Richard Whitehead drops in along with table tennis stars Will Bayley, Ross Wilson and Aaron McKibbin, cycling and athletics star Kadeena Cox, boccia's David Smith and canoeist Emma Wiggs. Adam Hills, Josh Widdicombe and Alex Brooker are live in Rio for the 'unofficial closing ceremony' of the Rio Paralympics 2016. For their last show from Rio, the boys are joined in the studio by a multitude of medal winners and heroes of the Games, including Dame Sarah Storey, Hannah Cockroft, Gordon Reid, Jordanne Whiley, Dan Greaves and Lee Pearson. Plus, there's the usual tomfoolery, sketches, clips, and anarchic discussion via nothing's-off-limits #isitok questions from both viewers and athletes. 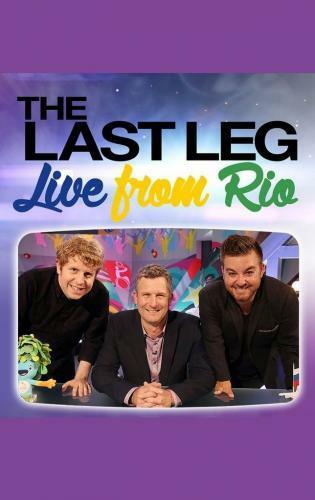 The Last Leg: Live from Rio next episode air date provides TVMaze for you. EpisoDate.com is your TV show guide to Countdown The Last Leg: Live from Rio Episode Air Dates and to stay in touch with The Last Leg: Live from Rio next episode Air Date and your others favorite TV Shows. Add the shows you like to a "Watchlist" and let the site take it from there.